With cardiovascular disease a leading cause of death in Australia, heart-friendly food choices are important. By making smart choices at home, at the grocery shop and at your favourite restaurant, you can reduce your risk of disease. Here are a few simple dos and don'ts to help guide your healthy decisions. Most Australians don't eat the recommended minimum of five servings per day, but vegetables of all kinds and colours should take centre stage in a heart-healthy diet. They're rich in fibre, vitamins, minerals and antioxidants that promote a healthy heart and body, plus they're filling and low in calories, which can help with weight management. Fresh, frozen, dried, canned (without sugar/syrups or added salt), raw, cooked – all vegetables are good for you. While small amounts of 100% fruit juice can fit into a healthy diet, they're also concentrated sources of sugar (naturally occurring) and calories compared to whole fruits, which also boast heart-healthy fibre while juice does not. Our bodies do need sodium, but we normally eat in excess of the recommended maximum of 2300 mg per day to prevent high blood pressure and heart disease. Remember that sodium doesn't just come from the salt shaker, but also from processed foods including canned products, condiments and deli meats and in cooking or at restaurants. Most people know that added sugar doesn’t provide any real nutrition. While many people associate sugar with the development of diabetes, few people realise that sugar also plays a role in heart disease. Sign up to our weekly newsletter and receive useful health tips and insights, expert advice, offers and promotions straight to your inbox. Receive your FREE recipe book and get over 20 recipes to start you on your healthy journey. To reduce your risk of heart disease you need to choose the right types of fat. 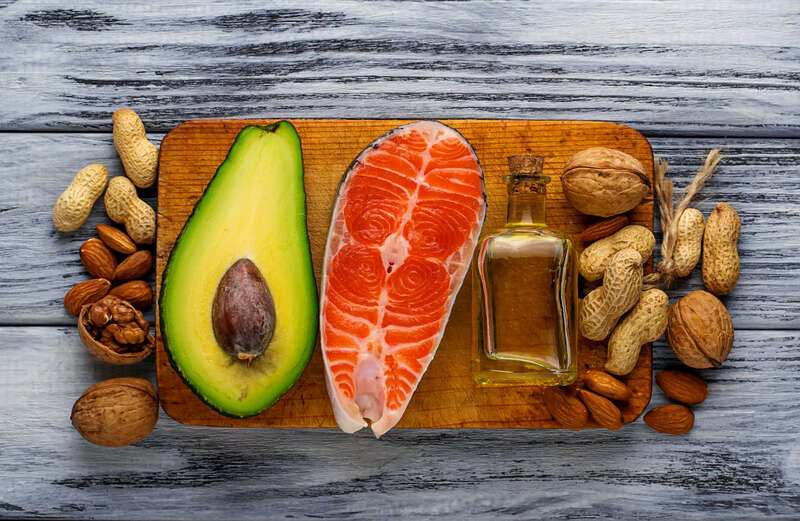 Avoid fats that elevate your cholesterol levels: saturated fats (usually found in high-fat meats and dairy products, baked goods and fried foods that contain palm oil, palm kernel oil and coconut oil) and trans fats (hydrogenated oils found in baked goods and some margarines. Choose products lower in saturated fat, try baking or broiling instead of frying, and reduce or omit the saturated fats that recipes call for (butter, shortening, lard). Monounsaturated fat and omega 3s actually promote heart health. Focus on making smart fat choices to meet your daily recommendations. Fats found in nuts, olive, soybean and canola oils, fish and seafood all help your heart. To reduce your risk of heart disease you need to choose the right types of fat. Avoid fats that elevate your cholesterol - saturated and trans fats. Research indicates that a moderate alcohol intake (no more than two drinks per day) has been associated with a decreased risk for certain cardiovascular diseases, particularly coronary heart disease. A high fibre diet (up to 30 g per day) can help reduce the risk of heart disease. Certain types of fibre may help lower LDL cholesterol. To meet your daily quota, select a variety of unprocessed plant-based foods each day, including whole grains, oats, whole-wheat bread/flour/cereal, fruits, vegetables and legumes including beans. While it may seem like there are a lot of ‘rules’ to follow to protect your heart and your health, it all boils down to making smart choices on a consistent basis. Make healthful choices most of the time, you'll be doing your body – and your heart – well.